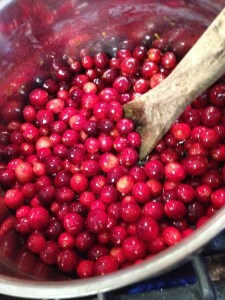 creating a cuvee cranberry sauce with Gloria Ferrer. There are very few dishes that I am permitted to make this Thanksgiving due to the sommelier’s presence at home instead of in a busy restaurant. Trust me, I am grateful for the break. (Plus, he’s a much better cook than I am!) However, part of me still longs for the menu planning, the search for gorgeous new recipes, trends, and act of bringing beautiful foods to a harvest table. Because cranberry sauce is a simple recipe that can be made days ahead, I grabbed the opportunity to add a new twist to our old favorite. I know I am not one to share recipes, but since this one involves wine… and drinking wine… then why not? If you have not had the occasion to make your own cranberry sauce before, you will find that homemade is more tart, less sweet, and more colorful that jelled canned sauce. Gorgeous shades of red pop out from the bowl, screaming with life and vitality; a beautiful addition to your Thanksgiving table. This year, we are feeding ten adults and four children, so I am planning on twelve servings. For this recipe, you will need a bottle of Brut Champagne or Sparkling Wine, an orange, sugar, vanilla, and cranberries. Because you only use a few cups of bubbly, I wanted to also choose a wine that I would also imbibe. 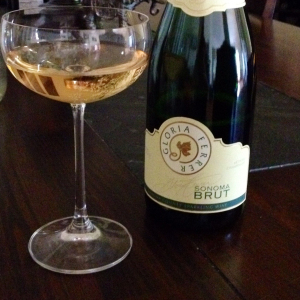 Therefore, after a few minutes scanning grocery store shelves, I decided on Gloria Ferrer Sonoma Brut Sparkling Cuvee. The winery sits in the Carneros Valley, just south of Sonoma and best known for Pinot Noir, and has been planting there since 1985. 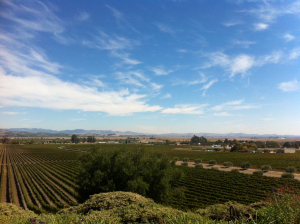 Gloria Ferrer was the first sparkling house in Carneros, as well as the first vineyard to plant Champagne clones. For those who did not know, Champagne or sparkling wine can be made from a few different varietals: Pinot Noir, Chardonnay, or Pinot Meunier. A Cuvee is a sparkling or Champagne that is made from a blend of these grapes, or even from different harvest years. Made from primarily Pinot Noir, with a little Chardonnay, this Cuvee sings with aromas of pear, vanilla, and raspberry, while the flavor of toast balances out a creamy finish. A gorgeous find at $16, and a notable sauce to add to your sauce. Perfect on its own or with toasted bread and pate, cheese, and charcuterie. To start, add two cups of sparkling and two cups of sugar to a saucepan on medium high until the sugar dissolves. Set to simmer. In a separate mixing bowl, add 24 ounces washed cranberries, two teaspoons of vanilla, one tablespoon of orange zest, and one tablespoon juice of squeezed orange. 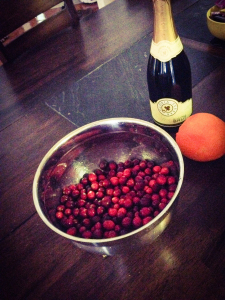 Once mixed, add cranberry mixture to simmering sparkling. 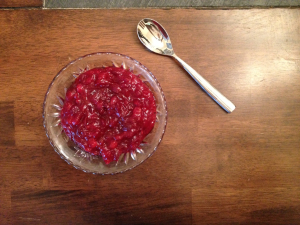 Allow cranberries to pop and sauce to thicken, while stirring occasionally. Remove from heat and allow to cool. Refrigerate for up to five days. Freeze for up to two months. There are other versions of cranberry sauce we have made with orange liqueur, marnier, or just plain with orange juice, however, I like this version made with sparkling wine the best. The toast and vanilla flavors of the Cuvee blend beautifully with the zesty cranberry to create a tart, slightly sweet, and popping addition to your Thanksgiving table. Something else to be grateful for. Cheers. Add sugar and sparkling wine to saucepan, set to medium high. Once sugar dissolves, set to simmer. In a separate bowl, mix remaining ingredients, making sure cranberries are well coated. Add cranberry mixture to saucepan. Allow berries to pop and sauce to thicken, stirring occasionally. Remove from heat and allow to cool. Refrigerate up to five days before serving. Freeze for up to two months. Giving Thanks. It’s that time of year again. 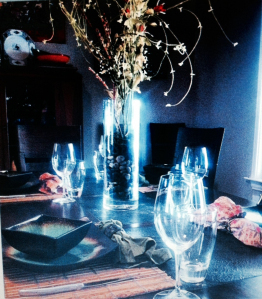 Time to start planning Holiday menus, inviting friends and relatives, dream of stuffing, take stock, make stock, (no, wait!) take stock!, buy turkey, cranberries, stinky cheese, and of course… prepare your holiday table for differentiating wine palates. Catering to everyone isn’t easy. Trust me. The last time the sommelier and I hosted Thanksgiving, we created a full-blown menu complete with bacon and corn gougeres, celery root potato bisque, cremini mushroom stuffing, and apple and raisin crumble. The food was really the highlight. We really didn’t plan for the wine, just served a sparkling, a few Italian reds, and a dessert specialty. At the time, my knight in cork armor was still running the wine program for Andrew Weissman, so needless to say, was not even home to enjoy the majority of our meal. The Holidays were always the busiest time of year. This Thanksgiving we are so thankful for our many blessings. The sommelier has been on a new adventure over the past year, and has spent countless hours under the tutelage of the owner of Classified Wines, as to gain an insight and love into the importing industry. Of course, the Holidays are once again the busiest time of the year; the sommelier is just physically home for dinner. As such, we have a different love for our old friend, the fermented grape juice hiding in dark smooth bottles, awaiting pours into our crystal glasses. And while we may be toasting to a great many wines, we recommend just a few for your table. If you are craving bubbly, but don’t want to break the bank with Champagne, then a Prosecco may be for you. Try not to be confused with the sweet Asti that the Italians are known for; Prosecco is much drier, with a second fermentation in stainless steel tanks, so it is generally lighter with a crisper air. 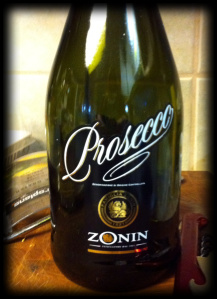 Zonin Prosecco will pair well with gougeres, country ham deviled eggs, an array of soups, bisques, and of course, a variety of cheeses. In all actuality, it pairs well with just about anything, so sip to your heart’s desire. With a winery founded by a Mayo neurosurgeon and a winemaker formerly of Duckhorn, this small family operation holds the right prescription for success. Just 125 acres in Calistoga, only 10% of production goes to Kenefick Ranch, while the rest is outsourced to bigger names such as Etude, Plumpjack, and Caymus. This Sauvignon Blanc is very tropical, with notes of pineapple, tangerine, and peach; a lush cream mouthfeel makes up the finish, which is longer than most whites. Pairs well with classic brined turkey and apricot stuffing. There are many reasons why this particular wine is perfect for Thanksgiving, the first and most important being the notes of fig, citrus, and anise, which flavor the season. Second, the vines that source the wine are at least 75 years old, and are a joint venture from a very well-respected family of Spain, Juan Gil, so quality is at the forefront of production. (Verdejo is a sherry like white wine that hails from Spain.) Third, Shaya’s finish is creamy with hints of honey. (It doesn’t hurt that it’s only $13, either!) Pairs well with candied yams, sweet carrots, or bourbon-glazed turkey. The vines hail from Switzerland, where the first founder, Michel, recognized the quality of Northern California soils and climate of the Dry Creek Valley. 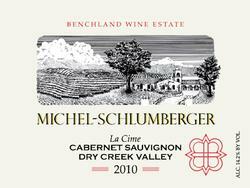 The winemaking style is suited more towards Alsace, France, like the second founder of the label, Schlumberger. La Cime Cabernet is more like classic Bordeaux, a blend of Malbec and Petit Verdot, with black currant, plum, and aromas of rich spice. Open up for at least thirty minutes or decant before drinking. Pairs well with andouille and cornbread stuffing, cranberry cocktail sauce, or spice rubbed turkey. For those guests who insist on organically grown, Juan Gil has answered the call. 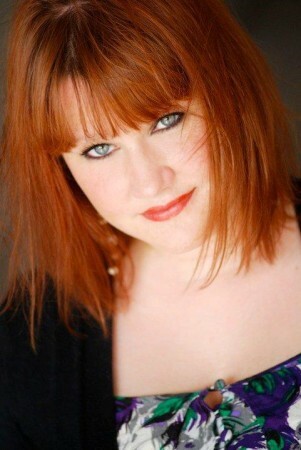 Monastrell is also known as Mourvedre, and is grown in regions of France, Spain, California, and Washington State. Juan Gil is a small family operation in Spain, which produces different varieties of wines. The Monastrell has aromas of black raspberry and cherry, with dark berry flavors. A bit of a peppery nose, this varietal adds excitement to a boring meal. A tangy finish with spicy notes, this wine also pairs well with cranberry stuffing or orange spice glazed turkey. A note about dessert… generally by the last course everyone has found their favorite wine and is grabbing onto their glass for dear life. Wine snob exceptions notwithstanding ( and sommeliers alike), there are some suggestions to staying local, albeit dangerously sweet. Messina Hof has some large varieties of dessert wines, including not only Riesling, but ruby ports, tawny ports, and sherry. 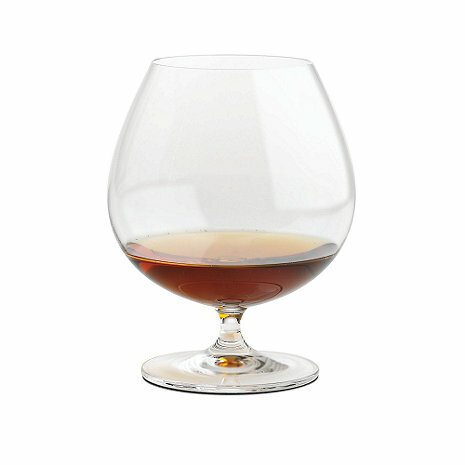 For the more refined palate, however, you might want to stick to a classic Brandy. Giving Thanks. Being Thankful can be its own blessing in disguise. Learning to be Thankful on a more consistent basis is a trait I have yet to master. Just think of what our lives would be like if we actually expressed gratitude every day of the year? Probably ahhhmazing. Cheers to you and yours this Thanksgiving. Note: This was a first collaborative effort between the sommelier and myself. Enjoy.